Riegl USA is proud to announce a new addition to the V-line Airborne Laser fleet of instruments that Riegl Laser Measurement Systems GmbH has released the VQ-580. The VQ-580 provides high speed, non-contact data acquisition using a narrow near-infrared laser beam and a fast line scanning mechanism and was especially designed to measure on snow and ice. High-accuracy laser ranging is based on Riegl’s unique echo digitization and online waveform processing, which allows achieving superior measurement results even under adverse atmospheric conditions, and the evaluation of multiple target echoes. The main applications for the VQ-580 are glacier and snowfield mapping, along with, agriculture and forestry mapping, topography and mining, lakeside and riverbank mapping, corridor mapping, city modeling and mapping of power lines. 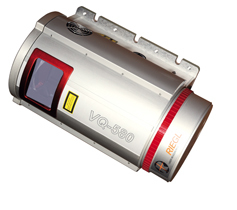 The Riegl VQ-580 is, mountable in any orientation, even under limited space conditions on helicopters or UAVs. This compact and lightweight instrument needs only one power supply and provides line scan data via the integrated LAN-TCP/IP interface. The binary data stream can easily be decoded by user-designed software making use of the available software library RiVLib. The key factor to Riegl USA’s success is the full service experience offered to our customers, from your initial purchase, integration of the system, training and support Riegl USA stands out as an industry leader. Riegl USA located in Orlando, FL, is the North American office for Riegl Laser Measurement Systems, GmbH, with headquarters in Horn, Austria. With over 32 years experience in the research, development and manufacturer of time-of-flight based optical radar systems. Our products are used for tripod, airborne survey, industrial process control, altimetry, aerospace, mobile, hydrographic and bathymetric applications. Riegl USA is recognized as the performance leader in the civil infrastructure, airborne scanning, mobile mapping, hydrographic, mining and terrestrial based industries. Our instruments are well known for their ruggedness and reliability under demanding environmental conditions. Riegl’s various 3D scanners offer a wide array of performance characteristics and serve as a platform for continuing “Innovation in 3D” for the laser scanning business.